Dutch police claim to have snooped on more than a quarter of a million encrypted messages sent between alleged miscreants using BlackBox IronPhones. 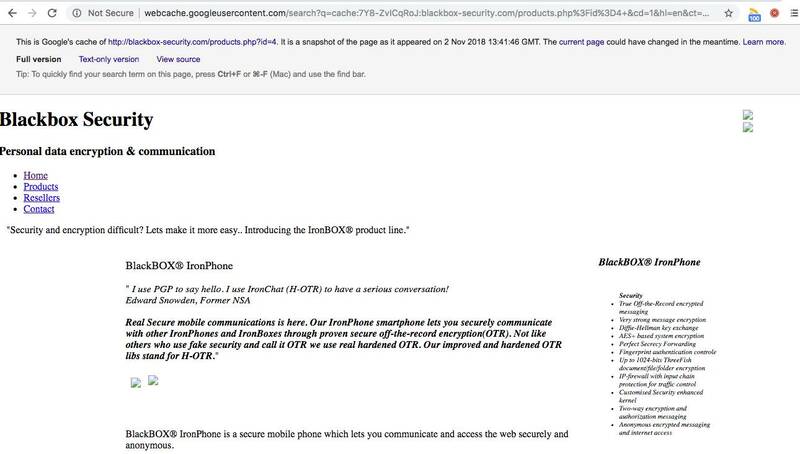 The suspects had been using the IronChat app on their IronPhones, which uses a custom implementation of the end-to-end off-the-record (OTR) encryption system to scramble messages. Netherlands police said the BlackBox smartphones cost “thousands of Euros” –BlackBox charged a seriously premium subscription of around €1,500 for six months of use – and sport a panic button that’s supposed to delete all a user’s messages when pushed. While the officers did not detail how they got hold of and cracked the encrypted IronChat messages, they had seized BlackBox Security’s server. It sounds as though the encrypted conversations were routed through that system. Therefore, once collared, that box – or a server masquerading as it – could have been set up to decrypt and re-encrypt messages on the fly, or otherwise intercept the connections, allowing the cops to spy on the chats. An error or weakness in the encryption implementation could also have been exploited by investigators, allowing them to crack messages intercepted over networks. In any case, intelligence from these conversations was then used to snare folks suspected of laundering money and other crimes. Specifically, the clog-plod seized the website and server of the Edward Snowden-endorsed company BlackBox Security after arresting two men apparently behind the business: a 46-year-old from Lingewaard, and a 52-year-old from Boxtel. Another three men were nabbed in Almelo and Enschede, and police expect to make “hundreds” more arrests in the course of their investigation. Aart Garssen, Head of the Regional Investigation Service in the Eastern Netherlands, said there have been 14 arrests so far in total, including folks cuffed at a suspected drug lab in Enschede where officers seized €90,000 in cash, automatic weapons, and “large amounts” of drugs like ecstasy and cocaine. He added that police moved on the criminal operation to forestall “retaliatory action” between members accusing each other of snitching to the cops.